All You Need Is The Love Of A Dog For Valentine’s Day. 1) A gift certificate from a Bay Area dog-friendly restaurant. 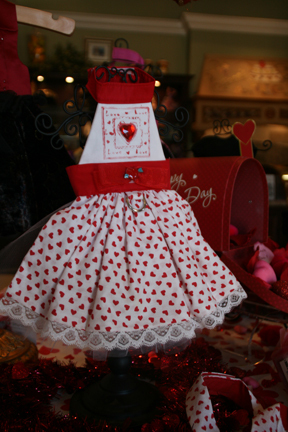 2) A gift certificate from Florida Jean Company or from Bella By the Sea Boutique. 3) A DVD of the Disney/Tim Burton film, Frankenweenie (a 4-disc combo pack). 4) A DVD of the family-friendly movie I Heart Shakey. 5) A perpetual dog-themed calendar, with beautiful black and white photos, and touching dog-themed quotes. Perfect for annual recurring dates like birthdays and anniversaries. 6) Tickets to upcoming dog-friendly events, such as Florida’s Largest Home & Garden Show or the Little Everglades International Combined Driving Event & Jack Terrier Races. 7) Then, you will automatically be registered (just by sending us your emailed receipt) for A Getaway Package from one of our dog-friendly Florida resort partners, like the TradeWinds Island Grand, Steinhatchee Landing Resort, Changing Tides, Hotel Indigo, Siesta Key Bungalows, The Chart House Suites, Heron Cay Lakeview Bed & Breakfast. So, how much do we love our dogs? Let us count the ways. 1) Accentuate Your Love – We found these pillows (shown below) at Fluffy Puppies in Clearwater. Vamp up a couch or chair, and show the world you love to adopt dogs. 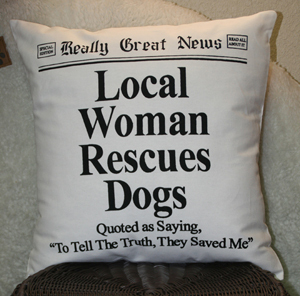 These pillows are the perfect Valentine’s gift for anyone who volunteers in animal rescue. 2) One of our most spectacular finds were these Bada Bling Bada Bloom collars at Fluffy Puppies (shown below). Exquisitely adorned with Swarovski crystal beads, you might think they would be ridiculously expensive. But, think again. They’re beautiful and reasonably priced. Perfect for a night on the town. 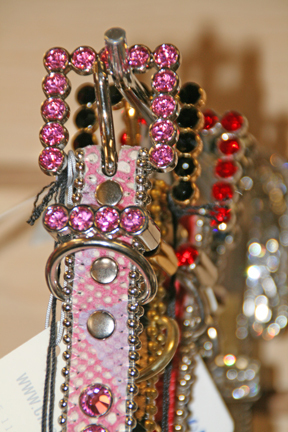 Gorgeous collars, adorned with Swarovski beads. Available at Fluffy Puppies. 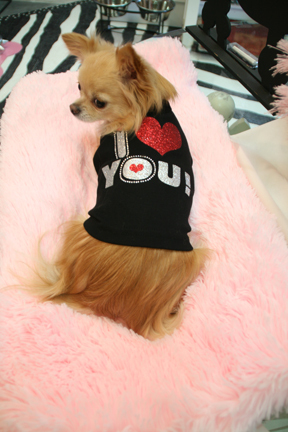 Nothing says “Be Mine” than the I Heart You tee shirt from One Lucky Dog, St. Pete. Soft, nicely cut tee shirts from One Lucky Dog, St. Petersburg. 4 & 5) Call Me, Maybe? Oh yea these numbers are one-of-a-kind finds, and available exclusively at Pawsitively Posh Pooch. Hand-sewn with delicate appliqués and jewels, the couture lines carried at Pawsitively Posh Pooch are from fashion-first cities like Milan, Paris, and Spain. Plan on spending some time here, as you uncover treasure after treasure, like the gorgeous harness, worn by store dog, Zoe. Available in various sizes. 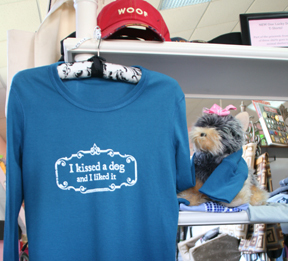 This couture doggie design, exclusively at Pawsitively Posh Pooch, St. Petersburg. Zoe, our Pawsitively Posh Pooch model, wearing a one-of-a-kind halter. 6) Dental Health Month. In conjunction with National Pet Dental Health Month, February is also Responsible Pet Owners Month. Now is a good time to stock up on some in-home preventive measures like the Fresh Breath Liquid Floss spray and Triflossball, available at Pet Food Warehouse. The dynamic duo treatment doubles as a great way to clean your dog’s teeth during playtime. Throughout February, Pet Food Warehouse is offering 20% off on all dental products. Stop in to see their huge display, and have your questions answered by a knowledgeable staff. 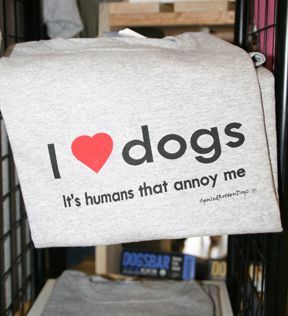 Be sure to check out their I Heart Dogs T-shirts. Another sweet Valentine’s gift for dog lovers. Floss and Fun with your dog for healthier teeth. Available at Pet Food Warehouse, St. Pete. Novelty tee-shirts, like this one, available at Pet Food Warehouse, St. Petersburg. 7) Environmentally dog-friendly. Who can resist the charming handmade and hand-painted Adirondack chairs, complete with a motif that includes your dog’s likeness? Wet Noses, the shabby-chic cottage boutique in Sarasota’s Downtown, carries some wonderful finds, created by local artists. 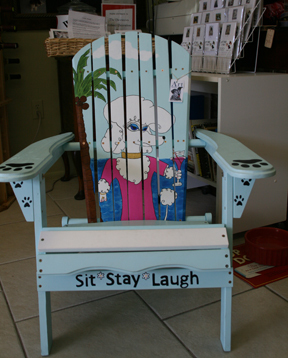 Handmade and hand-painted Adirondack chairs, available at Wet Noses Boutique, Sarasota. For the love of dog, come along and have some fun with Florida’s top dog lifestyle magazine. Be sure to stay connected to all things Florida Dog via The New Barker blog, Facebook page and Weekend PupDates. We’ll be offering fun specials and more giveaways throughout the year. 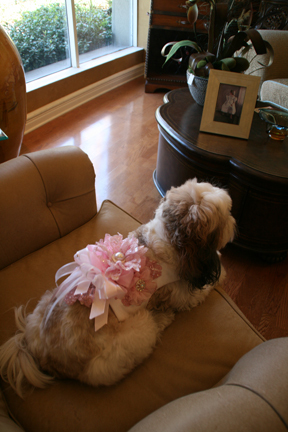 This pink/white harness was designed by Pink Punk Puppy Designs. We are proud to state that “Pawsitively Posh Pooch And Classy Cats Too” in St. Petersburg, FL, is the one and only exclusive boutique carrying our award winning designs. The new spring collection, including our new boys line for the fashionable four legged man in your life, will arrive in sunny Florida soon. Hi Carol. C’mon over for a visit. It’ll be worth the trip. Or, we will extend The New Barker giveaway to you when you stop in and say hello to Brian and Jeff at The Doggie Door in Winter Park or Marni and Paul at The Green K9 in Mount Dora. I need to move to Tampa ! Next Next post: Michael Phelps’ Dogs Pose with Super Bowl Trophy?